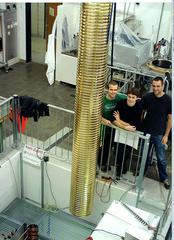 ArgonTube is a Liquid Argon Time-Projection Chamber (LArTPC) with record-setting 5-m long electron drift length. The detector was build for study of long electron drift and related challenges, such as electron diffusion in liquid Argon, free electron life time, generation of high potentials in cryogenic environments, etc. 3-ms life time is reached for the free drifting electrons in the detector. A Novel method of in-situ generation of distributed potentials of up to 400 kV was introduced and tested in the design. A novel method of LArTPC calibration with the use of UV-laser induced ionization tracks was proposed and successfully tested. 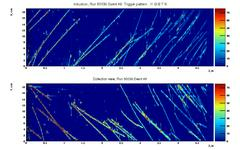 The method is employed now in several large-scale TPCs for modern neutrino experiments in Europe and USA. 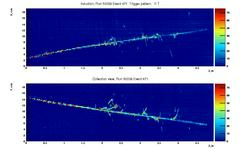 In the images below several spectacular cosmic ray events detected by ArgonTube are seen. Dielectric strength of liquid argon is a crucial parameter for design and operation of present and future large-scale Time Projection Chambers. ArgonTube operation has revealed some lack in understanding of the mechanism of dielectric breakdown in liquid Argon. A systematic study of the problem is performed at LHEP, resulting on discovery of anomalously-low dielectric strength at large distances. This study sets new reference for design of future large-scale LAr TPCs. Our group is world-renowned leader in the study of dielectric breakdowns in liquid argon. On this video one of spectacular discharges in liquid Argon, registered at LHEP is shown.